Particularly in Western Europe, the knights' duel on foot was regarded as a sport. As the husband of Maria (heiress of Burgundy 1457-82; married, 1477), Maximilian presumably first developed his marked preference for foot-combat at her pleasure-loving court. Two types of equipment were suitable: either the Kempfküriss with a flared skirt of iron, or the one which enveloped the body like close-fitting tights. Lorenz Helmschmid, the outstanding royal armourer of Maximilian's father, Frederick III, created foot-combat equipment for Maximilian around 1485--possibly for the festivities on the coronation of the young prince as Roman King in 1486. We can see what it looked like in a book left to us by the Helmschmid workshop, which contains sketches and illustrations recording the armour produced there. It came into imperial possession and from there, through a chief equerry to the Imperial Household named Thun, into the library of the Princes Thun at Tetschen in northern Bohemia. Only the original helmet has been preserved, a masterpiece of forging. For a long time it was the prize possession in the armoury of Count Breuner, later Prince Ratibor, at his neo-gothic castle of Grafenegg near Krems in Lower Austria. Its bright rounded surface must once have given the impression of a polished steel ball, the firm smooth shape thus displaying its full charm. A comparison of the accurate sketch with the original is sufficient proof that this was the personal property of the sporting monarch. Interesting in that it has the attributes of both the Salade (viz. the visor) and the Great Biscenet. Very strange, but also very nifty. Thanks yet again, Nathan, for posting a cool picture of a cool helmet! Gordon, once again you're noticing the same things I'm seeing and also finding them interesting! This stuff fascinates me and shows, yet again, that it's often not possible to categorize things in neat and tidy compartments. In fact, you can see by my sword collecting interests that I tend to like the off-shots of innovative designs that often combine multiple influences into an experimental form. Experimental innovation, perhaps as much as necessity, is just as influential on the developmental paths these things took. This stuff baffles me the more I track the paths they've taken. Amazing stuff. Nathan, I have to fully agree with you on a love of experimental, innovative, transitional things. I put together a pretty cool collection a few years ago of US Bolt Action .45-70 rifles from the 1870's and '80's- stuff no one really knows about, but enormously cool to me. I love Paterson and Walker Colts for the same reasons (but needless to say I have to satisfy myself with reproductions! ), Wheellocks and Snaphaunces too. And in armour or swords, it's the same thing. Transition between Salade and Close Helm, and the evolution of the Armet, the development of the Basket Hilt, all remarkably nifty stuff. My chief amusement these days is tracking the victory of the Pistol over the Lance during the course of the later 16th Century. It too was a time of experimentation, innovation and transition. Fascinating stuff! I just need more time to track it all down. A few more languages at my disposal would help a lot too, LOL! At the risk of being accused of being a "Copycat" that visor also reminded me of a Salade type visor: But Gordon got his reply in first. You are showing us some very interesting things: Thanks again for all the work and time it must take. Yea know when i see thing's of this nature i often wonder is realy that unusual or was it just something of a fasion statement by the owner who may have liked the look of a sallet(don't know how to spell the german version) and wanted to keep with the new trend of the close helm, and had this made to his own liking sallet with a built in bevor , like having a custom made shirt, it is a unique design and very attractive to me, i have often wondered with the aristocracy of the time how many custom sword's and piece's of armor were actualy made that we will never see, and have unique design. These are just my musing's. 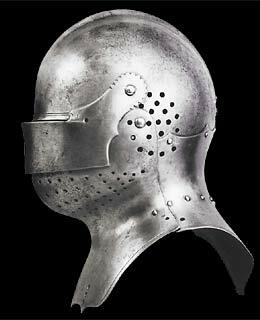 Incidenatly, this helmet is very well known in the armouring community, as it and one other are the basis for virtualy ALL sallets in the SCA and similar fighting orgs. It seems the rule-makers frown on two-piece, dismountable head defenses. So, we make our sallets into close helms.